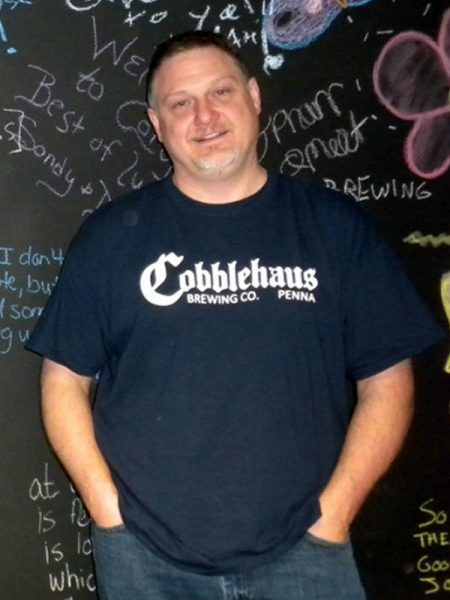 I’m the owner/manager/brewer at Cobblehaus Brewing Co. in Coraopolis, Pa. We’re a very small brewery so everyone wears many hats. I started homebrewing back in the mid-90s right after I got out of college. I took a trip to Colorado to visit friends after graduation and was introduced to craft beer. I fell in love with it and started brewing upon my return home. We opened the doors in April 2017 so we still consider ourselves one of the new kids on the block. We have been trying to continuously grow and spread the word and get people introduced to Cobblehaus. This past summer we started participating in local beer fests, focusing on events that highlight breweries in the Pittsburgh area. Another recent addition is the introduction of a Crowler machine at the bar. The camaraderie and friendships. When I decided to start working on planning the brewery, I contacted a few of my favorites in the area. I wasn’t sure what to expect: would they be friendly, would they be protective, would they be helpful? Across the board, everyone was amazing. Our imperial stout (Imperial Shadow) with a flourless chocolate cake and raspberry glaze. For a time, I was a single father for my two pre-teen daughters. I might be a bit biased, but I believe they have grown up to be impressive young ladies. Once back in Pittsburgh, I remarried and we now have our own version of the Brady Bunch with four daughters, one son, and three dogs. We make a great team! Either Orval from Belgium or Zum Uerige Alt from Dusseldorf. Not much can beat sitting in the courtyard in Dusseldorf getting your coaster “ticked” for each alt you enjoy. My wife and I have started taking annual beer tours, creating our own trail. We’ve found many incredible breweries and beers. However, my favorite destination goes back to my travels to Dusseldorf. Enjoying an alt in the Altstadt of Dusseldorf and the incredible hospitality of the people is hard to give justice to in words. Sleep and spend time with family.